Do Cats Grieve? Do They Mourn the Loss of a Companion? Do Cats Grieve for the Loss of Another Cat? If so, how can we best help our kitties to cope? One of our readers had to have one of her cats put to sleep. She asked for some advice about helping her cats get over the recent loss of that cat. Her cats were not acting right and not eating. I reached out to our readers on Facebook and asked them for help so that together, we could help this cat loving family as well as future readers. Hundreds came out in support of our reader. There were many sad stories of cats who had passed and the remaining cats having a difficult time adjusting and coping. Many of the stories were very similar, indicating that cats feel deeply for the loss of their companions, both animal and human. I've collected the best ideas on helping your cat to cope, and put them on this page. Thanks to all who contributed! I had to put one of my 4 cats to sleep on Thursday. The other 3 ate OK on Friday, but haven't eaten since then. One of them who usually doesn't hang out with us is staying real close now. Is it possible for cats to be depressed and how can I help them? In my experience, cats can experience depression and definitely can mourn the loss of a housemate. Some become more aloof, others more clingy and needy. Sometimes they'll go off food for a while or seem to sulk, or just aren't quite themselves. From my perspective, the short answer to how to help grieving cats is to give lots of love, have patience, and meet their needs as best you can. Give them time to grieve. Give them space if they seem to need it. Give them more love and attention if they seem to need it, and distract them with play/exercise, toys and stinky food (or whatever their favorite food is). For example, if tuna works, use that. If treats work, use that. Some cats love sardines. Sprinkling tuna water on some dry cat food sometimes works. It just depends on what your cats like. For play/exercise, try an interactive wand/fishing pole type toy like Da Bird (or whatever their favorite toy is). Get a couple of cardboard boxes and buy some new "throw around" toys like crinkle balls (or whatever they like). Leave one box open so they can jump in an out. Seal up the second box and cut a hole in it on the side so they can go in and out. Throw some of the new ball-type toys into each box. Paper bags are a big favorite of many cats as well, or a new scratching post might help. In extreme cases, antidepressants may be required. 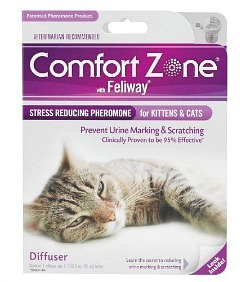 Feliway is a good alternative to medication and I'd try that first. The overwhelming answer from our Facebook audience is that yes, cats do grieve for the loss of a companion. In fact, some of our readers even said that their cats passed away shortly after experiencing a loss of another pet. In other words, they literally died of a broken heart. Others said that their cats would constantly look for the other pet after they were gone or call for them. Some cats changed their behavior patterns after a loss. Some became more clingy and sought attention and closeness. With some, it took up to a year or more for their cats to stop grieving and others feel that their cats never really got over the loss completely. The consensus is to give extra love and attention to your cats during this time. Groom them a lot and talk to them often in a soothing voice. A number of readers said that allowing your cats to "say goodbye" by either seeing the body of the deceased or sitting on top of the other cat's grave seemed to help with the adjustment. A few readers said that they successfully helped their cats get over their grief by adopting a new kitten or a cat about the same age. One reader's vet told her to get 2 kittens for her grieving cat. Why 2? Because the kittens could play with each other and the older, grieving cat could watch and join in when he wanted. It worked, and he started eating and playing again. Some of our readers said to wait a little while before adding a new companion, giving your cat time to grieve. Play with your cat more often or try a DVD for cats for them to watch. Get some new toys or break out their favorites. If you have a blanket, pillow or toy with the scent of the deceased cat, allow them to spend time with that as it seems to be comforting. To get them to eat, try a vet prescribed food or baby food. Based on the collective experience of our readers, cats definitely do grieve for the loss of a companion, even across species (some readers mentioned that their cats mourned the loss of bunnies, dogs and humans). There were some stories of kitties that started to become upset when their housemate became ill or was about to die. This has been reported with respect to humans who are near death as well, such as in the case of Oscar the therapy cat. None of this should be a surprise to anyone who knows how emotional cats can be, but it's interesting (and helpful, I believe) to see it confirmed. I hope that the advice here offered by our community helps you and your cat to work through your grief after a loss. Sometimes people have difficulty adjusting and coping with the loss of a pet as well. If that's you, please reach out to someone who can give you support. Some readers have taken comfort in the responses they get from our community, and many have said that simply posting a cat memorial has helped. There are products that are designed to ease your cat's stress. They may help with certain behavior problems, including aggression, urine marking, and problems due to anxiety. 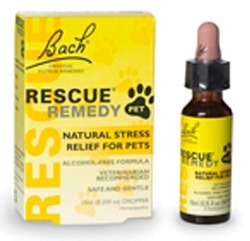 Bach's Rescue Remedy for Pets -- Helps to relieve stress in pets. Feliway Diffuser -- Helps to calm cats.